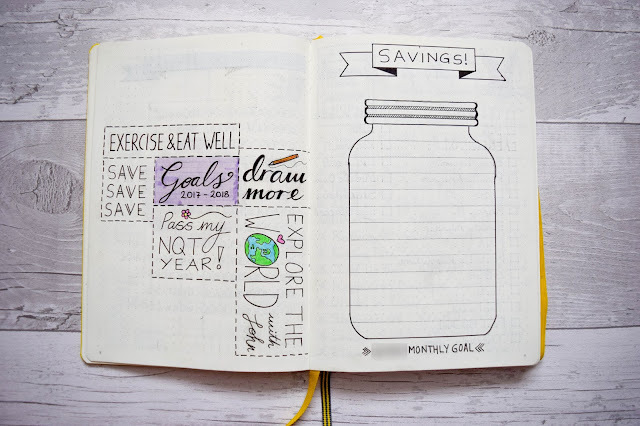 Welcome to a new series on my blog - the bullet journal series! 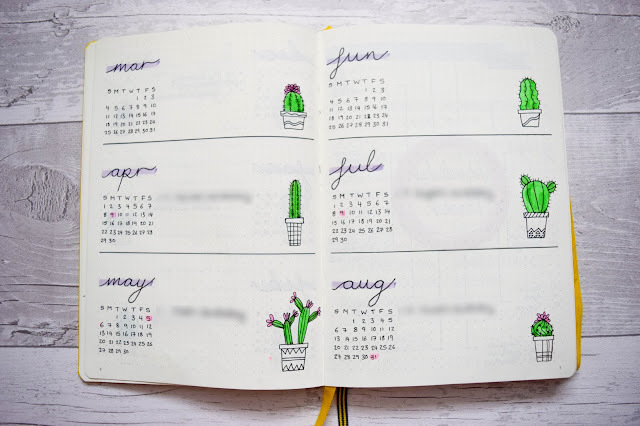 A few months back I found myself in the depths of the internet looking into bullet journals, what it was and how to create one. I was so in love with it, I bought myself a bullet journal and I spent months researching them and creating a Pinterest board of ideas to be inspired by before starting my own one. Now that the academic year is about to begin, I'm ready to start my bullet journal and I have it all set up. In this post you'll see how I've started mine, personalised it and explain a little bit about each page. If this is for you, I hope you enjoy and will enjoy future bullet journal posts! So I bought my bullet journal on Amazon here. After lots of research I learnt that the best ones were dotted and the more favoured ones are the Leuchtter1917 dotted notebooks which is the one that I have here. I got mine in a lovely bright yellow because I wanted it to be bold and exciting and represent my personality a little bit. 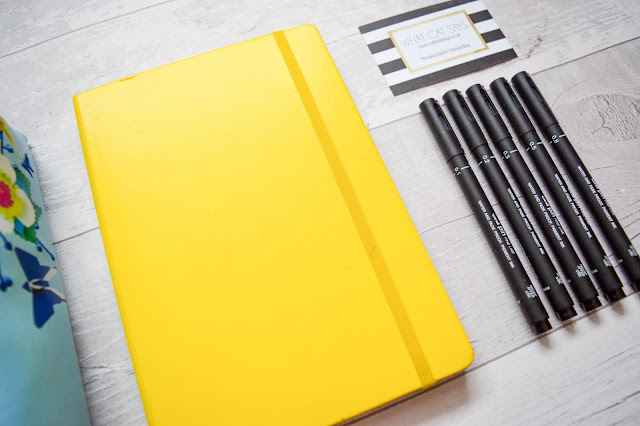 I think yellow suits me at the moment and also I don't feel it's a popular colour journal to go for. I bought it in the A5 size too which is the perfect size for bullet journaling. 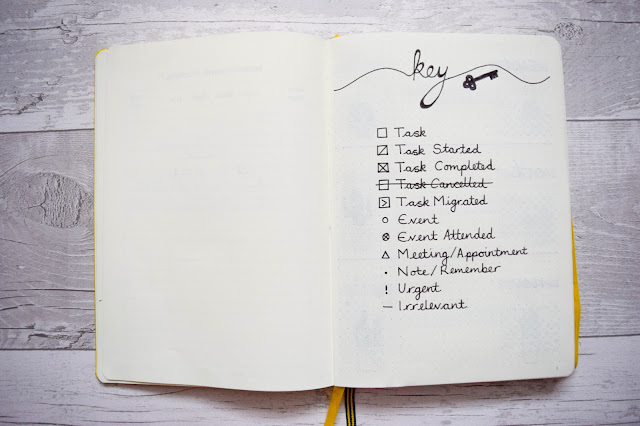 I started my bullet journal with one of the most crucial things to any bullet journal: the key. I looked at A LOT of keys before deciding what my key would be and this is what I settled with. There is a lot but I thought, even if I used it once it would have been useful. We will see. Anyway, I kept the design for this page simple because it would be one I refer to often and wouldn't want to get sick of seeing it. I might add some yellow washi tape to the edge though so I can find it when I need it without flicking through (even if it is the first page)! My bullet journal is going to be used a lot more for at home organisation that being out. I want it to be both for work and my blog and so I want to use it more leisurely than my Ban.do agenda which will be more professional and for work and appointments mostly. If you're wondering why I started in September too, it's because I prefer to work with the academic year especially because that's when my work year begins so it makes a lot of sense to start these things in September for me instead of January. Here is my yearly overview pages. As you can see I've started adding in important dates but I've blurred them out for a little privacy. I liked the idea of having them in thirds over four pages so I settled for this design. 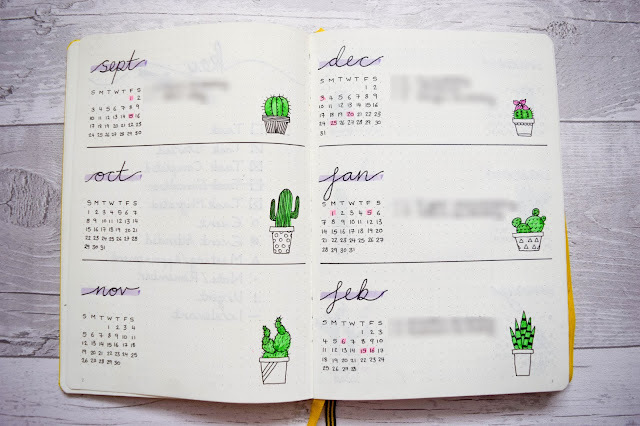 Now, of course I love cacti so I added a different cactus to each month to make it look more fun and exciting. I love these pages the most in my bullet journal at the moment. I think they're cute and will be one of the most useful pages in planning! I decided to highlight dates in pink and those dates correspond with the event written alongside the month's calendar. I really like these pages and mostly because I know I'll refer to them often. On the right I have my monthly savings to help me mark out when I've saved a certain amount of money. Each line can be filed when I've reached the monthly goal. So for example if I hit my monthly goal in September, I can colour it in and write September over it so I know I've saved it in September. It'll help me keep track of how much I've saved and when I'm saving it. On the left I have my goals for 2017-18. I have some obvious ones and some that I really need to focus on. I've thought of a couple more to add on there since too. I didn't want to fill it straight away because you can't determine all your goals at once. I think I'd like to add another page at the end of the year where I write about whether I reached these goals. It'll be like I do here on my blog but for myself. Revisiting the savings page will make me look at this too so I think these sit well hand in hand for motivation. Birthdays and phone numbers. 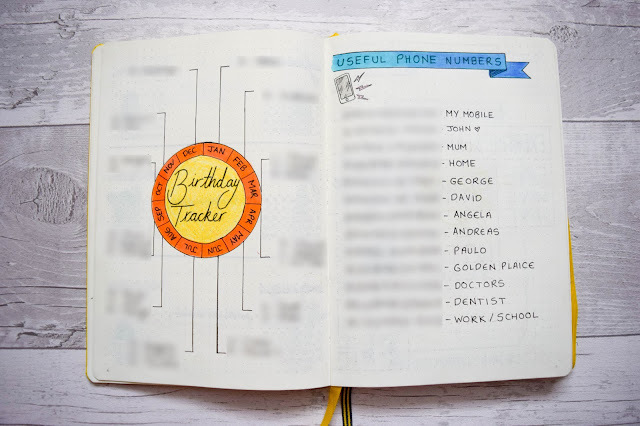 I can never remember people's birthdays unless they are very close family or friends so this tracker is to help me know when it's who's birthday. Looking at it now, I don't like this page a lot. I wish it looked prettier but for my first one I think it's okay too. I might pretty it up with some doodle drawings around it but I'm worried about ruining it too. Either way, it is a useful page of information that's often accidentally forgotten! On the right I have phone numbers that are most important because you never know when your phone might die and you need them. Whether it is because you ran out of battery, your phone is lost/stolen or because you left it somewhere. Here are the numbers I will need most. I have a couple more to add but I think this page will come in useful in the most unexpected way one day. Here I have two pages that I just wanted to add a little personality to my journal. First up on the left I have a list of cruelty free brands. 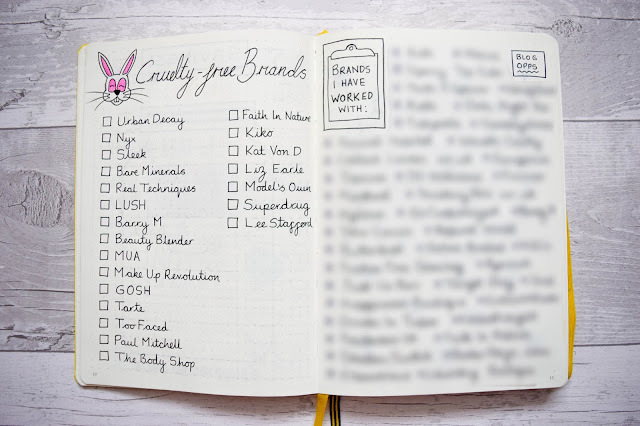 I thought this might be useful for the days I go out shopping and am unsure of brands that might be cruelty free, I can go on here and check which ones I know I can buy from. I know there are a few more I can add but these are the top ones I found in the UK. It will be useful at some point! On the right is a page to remind me how successful I have been with my blog. 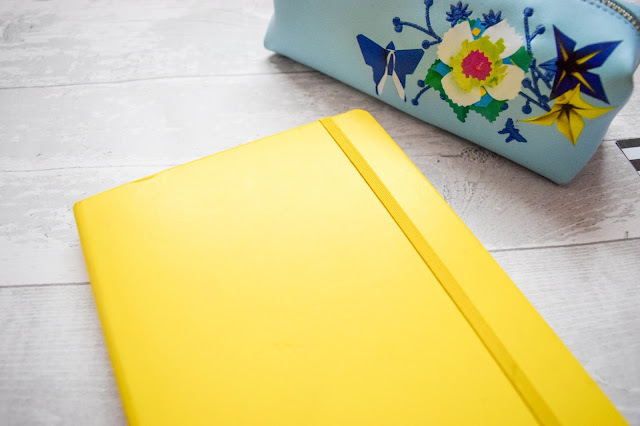 Sometimes I feel a bit rubbish about my blog and think I've gone no where with it but here I have filled this page with brands I have worked with to remind myself of all the amazing people and brands I have collaborated with because of my blog. I feel it's good to have a list of them altogether too so that you have a log of contacts. Of course here I just have names and I've blurred them out to avoid looking like I'm bragging. I have been blogging 7 years so it's accumulated. I have a couple more to add but that might be for a new page at the back of my journal. Like a 'brands I have worked with continued' page. 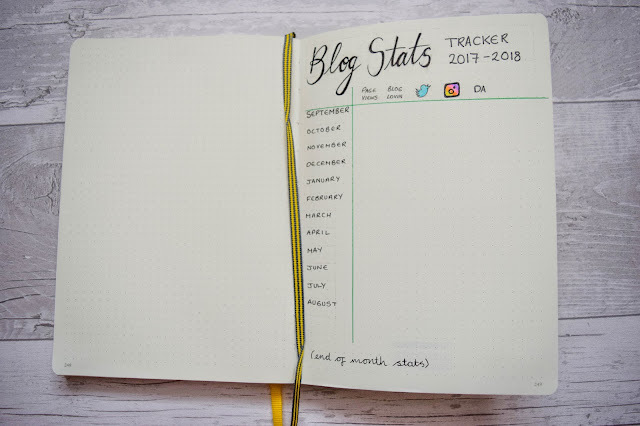 Here is my first tracker and it's a yearly one for the blog. I only thought of this after adding in September the other day, so I put it in the back for easy access. Here I want to track my Twitter and Instagram following, my Bloglovin' followers, page views and my DA rating. I think these are the most important for me to track at the moment and I have a mini key of colours I will use to show growth or loss here. Like a green/red pen situation. I want to track this from the end of the month so I'll add in September's stats on the 30th. I'll know what my August stats were so I'll be able to begin tracking growth/loss easily. So that is my bullet journal set up. I'm so close to the beginning of September that I'll be posting my September set up in the first week of September instead of before. I really have got into stationery and organisation again so I'm excited about this series and I hope you are too! It's a new passion I hope I can share with a lot of people. I've already inspired Ana to start one, maybe I can inspire more! It's really easy and what you have to remember is, it's personal. No two journals will be the same and it doesn't matter if you make a mistake. You can actually pull the pages out neatly and start again or learn from it for next time. Being my first journal, I expect to make mistakes. I hope though that this can be great for holding memories and helping me overall more organised with my life!